Today’s episode of Yeh Rishta Kya Kehlata Hai starts with Ella telling Naira (Shivangi Joshi) that there are such people who just want to spoil names of rich men so that they will get some profit from it. Naira is upset and tells that even when she is showing Ella the truth she has closed her eyes. Purushottam tells them to stop and acts as if he is tensed and goes from there. Naira goes inside to tell Kartik about it. Just as Naira goes in Mansi holds her hands and take her in and ask what did Purushottam do to her. Mansi wants to say something to Naira but she sees Purushottam there and gets scared. Naira asks her what is the matter but she goes from there. Naira wonders what is the matter and thinks how will she come to know. Seeing Kartik (Mohsin Khan) she goes to tell him, suddenly she hears Kartik talking in phone with someone and shouting and telling that he believes Purushottam very much and that he will not hear any bad words for him. 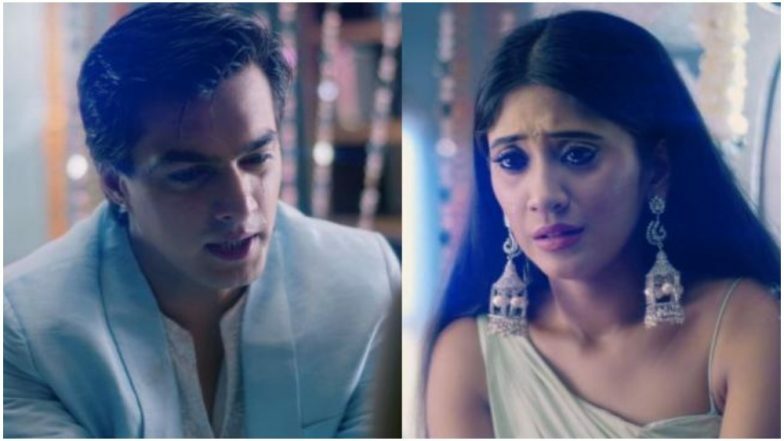 Kartik sees Naira and tells how people talk about someone without any proof, Naira thinks she should get some proof so that Kartik will believe her. Just then Purushottam comes and tells her why is she wasting her time as no one will believe her and if Kartik gets angry he will not spare her. Naira tells Purushottam that he should be afraid as when Kartik comes to know what had he done to her then he will see what Kartik will do to him. As Naira gets ready for the function, she thinks where is Mansi gone. Kartik comes and seeing her all ready praise her beauty. Naira is upset and seeing her like this Kartik asks what is the matter. Naira does not want him to get tense so have some fun with him to change his mood. Naira while going, checks on the internet if she gets some information about Purushottam, just then she recalls that he works for so many women trust and calls one of them to get some information. Their Suhasini is tensed if all the preparations are done or not as all the guests will be coming, just then Gayu comes with all the family, they greet each other and welcome them. The mehendi function begins of Samar and Gayu, Kartik tells that all will enjoy today’s mehendi as there will be a twist today. Naira tells everyone that she has decided a theme, as they will ask a riddle to everyone making two teams, Naira tells maybe by this people will come to know some truth also. In the precap, Naira is telling Suhasini that she will tell everyone about Purushottam, but Suhasini shouts at her not to tell anyone about this.